Canadian hemlock trees are members of the pine family. If you have heard of poison hemlock, particularly the hemlock that ancient Greek philosopher Socrates was forced to drink, this hemlock is not the same plant (Conium maculatum). Instead, the bark of this tree is one of the primary tree sources of tannins traditionally used for tanning hides for clothing during the 19th and early 20th centuries. Along with its better-known relatives, the eastern white pine trees, these trees are among the most common evergreen trees growing in the forests of eastern North America. They are pyramidal or conical in shape and their small needles give them a fine texture. The needles are dark green on top and light green underneath. The bark of Canadian hemlock trees at maturity may be cinnamon-red or reddish brown. Moderately slow-growing and long-lived, Canadian hemlock trees in the wild may reach 80 feet tall or higher with a spread of 25 to 30 feet. These are fragrant plants and crushing the needles releases the aroma. Flowers are produced in spring with cones ripening in the fall and releasing seed during the winter. It is best grown in cool, moist, well-drained soils and protect from wind, if possible. Unlike many large trees, Canadian hemlocks will tolerate (but do not need) quite a bit of shade. Their sunlight requirements thus give you a lot of flexibility with them, as you can grow them as anything from full-sun plants to shade plants. These trees require a soil that is moist, but that offers good drainage. They prefer a loamy, acidic soil. Shallow-rooted, these plants need protection from the wind, or else you might return home one day after a storm only to find your tree lying on the ground. Hemlock trees require a fair amount of water. It can tolerate less favorable conditions (full sun in average soils of alkaline pH) if sufficient supplemental water is given during the dry periods of summer, as long as the soil is well-drained. Eastern Hemlock does not tolerate standing wet soil, nor prolonged drought. The best method of watering is "slow watering" once a week. Start the watering process with a generally spraying down of the trunk and leaves. This will help to wash away bugs and pollution residues. Then, place the garden hose at the base of the tree and allow it to run for 15 to 20 minutes—this will distribute the water to the root system effectively. This tree grows in regions with cool, humid climates. In the northern areas, January temperatures average 10 degrees Fahrenheit and July temperatures average 60 degrees. Precipitation ranges from less than 30 inches. This tree needs a well-balanced fertilizer (10-10-10) about once a year. Do not add fertilizer to your hemlock during transplanting since it can burn the root system and it could lead to the death of your hemlock tree. Wait a few months until the tree is established. Hemlock can be easily propagated, either by seed or by cutting. Seed: Sow hemlock seeds in the fall so they can spend the winter outside in the soil. The chill of the long cold winter period is necessary for sprouts to come up in the spring. If you plant them in the soil in the spring or summer, they will not germinate. The planting bed should have well-drained, fertile soil—mix sand, compost, and manure together with the topsoil. Choose a site that receives partial shade and not too crowded by other trees. Water the soil until it is thoroughly moist, scatter the hemlock seeds over the surface. Cover the seeds with about 1/2 inch of soil and water until it is thoroughly moist. Leave it until spring. Thin out the seedlings by gently pulling out the smaller and weaker ones, leaving the stronger seedlings to continue growing without being crowded out. Water the seedlings whenever the surface of the soil feels dry to the touch. Cutting: Cuttings can be taken from semi-ripe branches for propagation in late summer. Cut the new part of a branch that grew that season. The branch should be green at the tip but browning toward the base of the node. Make a clean cut (no tearing or breaking the branch). To encourage successful rooting, dip the base of the cutting entirely in a rooting hormone powder used for woody shrubs and trees. Place the cutting in a pot filled with well-drained potting mix. Push the base of the cutting into a well-draining potting mix soil about 2 inches deep in the pot. Place the pot in a partially shaded spot in a greenhouse or inside the house near a window for the winter. Keep the soil moist but not soaking. Water the soil when the surface is dry to the touch. Transplant the cutting in the late spring to a plant bed preferred for sowing hemlock seeds. Canadian hemlock trees can serve as specimen plants or as living-wall privacy screens. Compact cultivars, which are essentially shrubs, are commonly used as hedge plants or in foundation plantings. If you begin pruning them when young, they are fairly easy to shape. Two virtues of Canadian hemlock trees are that they are shade tolerant and make very little mess. 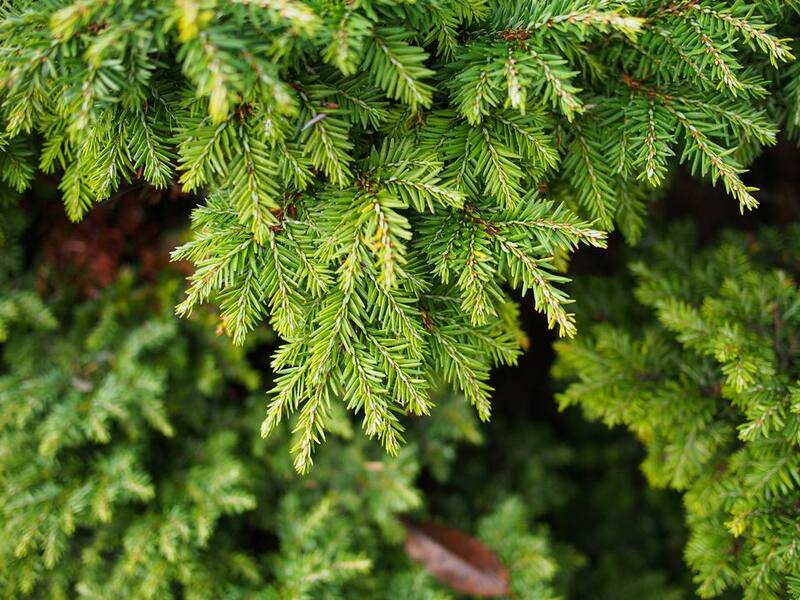 Canadian hemlock trees have two major drawbacks in the form of two pests that attack them: wooly adelgids and deer. Their susceptibility to wooly adelgids (Adelges tsugae) is concerning they are an invasive species of insect and a type of aphid. This insect has been a major pest problem for many years in eastern North America. These plants are also eaten by deer pests, so avoid growing these trees if you are seeking plants for deer control. As an alternative, select a deer-resistant tree. There are many cultivars of Canadian hemlock trees that have been developed for landscape use. Such cultivars have been bred specifically to function in circumstances where a tall tree would be undesirable. Dwarf "Gentsch White": This rounded, compact, shrub-like plant attains only 4 feet in height (by about the same width). "Aurea Compacta" (also known as "Everitt's Golden"): These Canadian hemlock trees reach 8 to 10 feet in height, with a spread only about half that, and have golden foliage instead of green. The "Sargent" or "Pendula" cultivar has an attractive weeping form. It grows about 5 to 8 feet tall (and twice that in width) and can sometimes reach greater heights.